Israel has authorized a transfer of medical equipment from Turkey to a hospital in the Gaza Strip, a Palestinian Authority official said Monday. PA Minister of Civil Affairs, Hussein al-Sheikh, told Ma'an that his office submitted an application to Israel over a year ago to request a transfer of Turkish medical equipment. Israel officially authorized the request on Monday. The Turkish Friendship Hospital was built in 2013 after Israel agreed to allow Turkey to transfer construction material. Two Palestinian ministers will visit the al-Maqasid Hospital in East Jerusalem to discuss a severe financial crisis the hospital has been facing for several years. 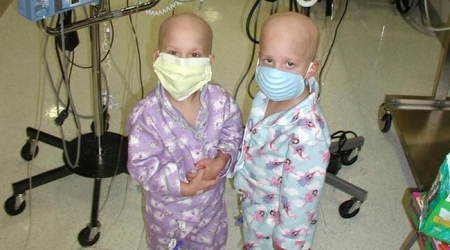 A public information officer of the Palestinian ministry of health confirmed Monday that minister Jawad Awwad and minister of finance Shukri Bishara would visit al-Maqasid Hospital Tuesday. 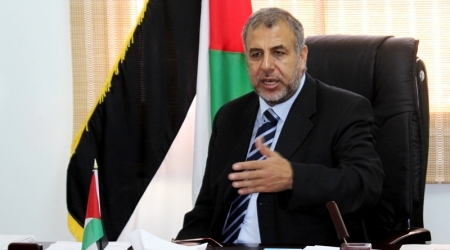 Omar al-Nasr added that the ministry had been following up with the financial crisis and the protests by employees in the central East Jerusalem hospital. The al-Maqasid Hospital, on the Mount of Olives, is the main recipient of patients referred by the PA ministry of health from the West Bank, Jerusalem and the Gaza Strip. The hospital has been suffering from a crippling financial crisis in the past few years. 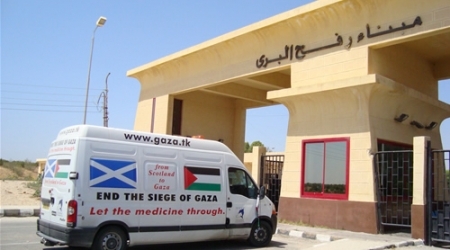 The administration and the employees’ union say the crisis emerged because the PA doesn’t pay regularly on behalf of hundreds of patients referred by its ministry from the West Bank and the Gaza Strip. 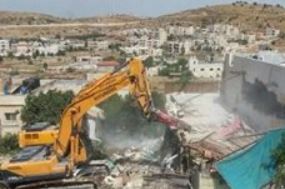 Al-Nasr highlighted that the ministry transferred in February and March 6,129,000 shekels to the hospital. More money will be transferred, he added, when the government transfers it to the ministry’s budget. 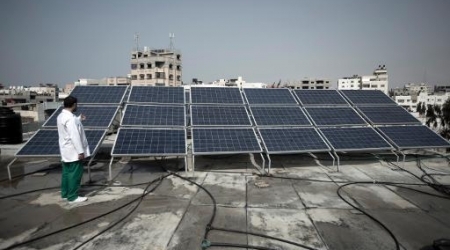 Gaza’s Palestinians, Besieged by Israel, turn to Solar Power energy crisis. As the coastal Palestinian territory lives through the worst fuel shortage in its history, many of Gaza's 1.6 million inhabitants are beginning to see solar power not just as a viable alternative, but perhaps as the only solution to the energy crisis. "We were forced to consider relying on solar power alone after the energy crisis that events in Egypt brought about," said hospital director Nabil al-Burqani, referring to the closure of cross-border tunnels which halted the fuel supply into Gaza. "We need solar energy in order to keep up care for babies in the maternity ward," he told AFP. "If there's just a minute-long cut to the electricity that runs the baby incubators, a child could die." The ruling Hamas movement has blamed the crisis on Egypt's destruction of cross-border tunnels which had been used for importing fuel, a decision implemented after the military overthrew Islamist president Mohamed Morsi in July 2013. The tunnels had played a key role in Gaza's economy since 2006, when Israel imposed a blockade after the capture of an Israeli soldier by Palestinian militants in a cross-border raid. The restrictions were tightened the following year when Hamas seized power. By harnessing the energy of the intense sunlight that beats down on the coastal enclave most of the year, Gazans are optimistic they can overcome the crisis in the long term. And initial setup costs -- which include buying and installing panels and converters, and the batteries needed to run them -- are potentially outweighed by the benefits. 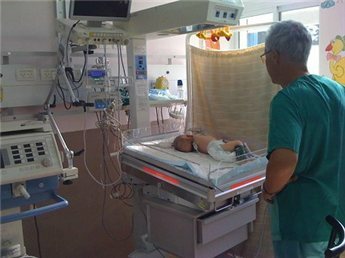 The project at the children's hospital, which was partly funded by British relief charity Sawaed, was set up in January 2013 at a cost of $100,000 (74,000 euros) and is now providing 20 kilowatts of electricity per day. Elsewhere, a Kuwaiti donation of $6 million is paying for the construction of five new schools, all of which will be equipped with solar panels, the education ministry said. But the solar drive is not limited only to large-scale foreign-funded projects. Individual families, if they can afford the initial outlay, are also switching to solar, which promises to be a much safer alternative than generators. After the fuel crisis kicked in, mobile back-up generators quickly became commonplace, but were often unsafe, causing a string of deaths through explosions, fires and carbon monoxide poisoning. Shadi Jawwad bought solar panels for his home in the central Gaza Strip after getting a bank loan. "There's no electricity or fuel to run the generators or the power station in Gaza, but we can use the sun," the 44-year-old government worker said. "My own solar set-up cost 5,000 shekels ($1,400/1,000 euros), and with it I can get enough electricity to light my home and keep the television on for several hours, even during the regular power cuts to the main supply," Jawwad told AFP. "This is a safe way of keeping my home running... And I only make one down-payment to set up the solar power system, rather than having to buy more petrol every day for my generator at fluctuating and often extortionate prices." Figures released by the UN humanitarian agency OCHA show that in November, Gaza received less than 20,000 litres of fuel per week, down from nearly a million litres a day when the tunnels were operating. Gaza's sole power station ground to a halt on November 1 after diesel stocks ran out. It only went back online 50 days later after a delivery of Israeli fuel which was paid for by the Western-backed Palestinian Authority. But the need to seek alternatives to carbon-based fuels appears to be sinking in. 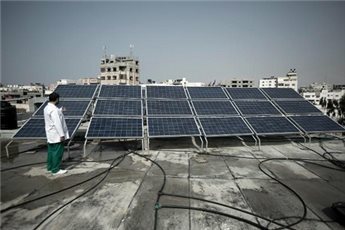 On its website, Gaza's energy authority says it is looking to introduce "a strategy to encourage solar energy use," in the hope that by 2020, solar power will account for 20 percent of the territory's energy consumption. For now, it is relying on a stock of solar equipment which was brought through the tunnels before Egypt shut them. 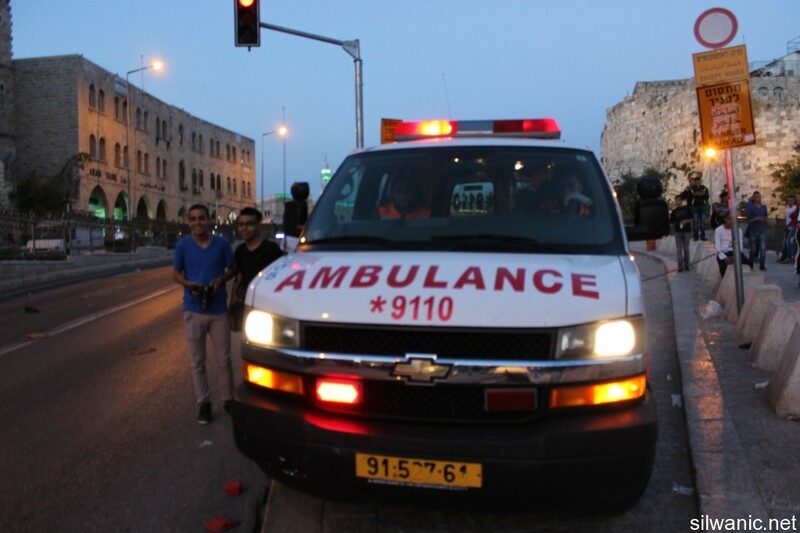 The guards of Shaare Zedek hospital prevented on Thursday night a Palestinian Red Crescent ambulance from entering the hospital to transfer an old woman from Shu’fat refugee camp. The paramedic officer, Ali Abu Ghazaleh, explained that the guards prevented him from entering the hospital in the ambulance and detained him twice at the first and second gates. He said: “the guards at the first gate stopped the ambulance for few minutes and after checking my ID they allowed me to get in. At the second gate, we were surprised when the guards prevented us from entering and they detained the car including the passengers (driver, three paramedics and an 84-year old sick woman) for half an hour. He explained that the guards forced the paramedics to transfer the woman on a stretcher despite the cold weather. Ala’ Arna’out, coordinator for volunteers’ affairs in Jerusalem, explained that an official claim was filed to the Israeli Ministry of Health against the guards of the hospital and pointed out that there are audio and video recordings of the incident. He also pointed out that the ambulances have the necessary Israeli permits to operate anywhere without any obstruction or delay. 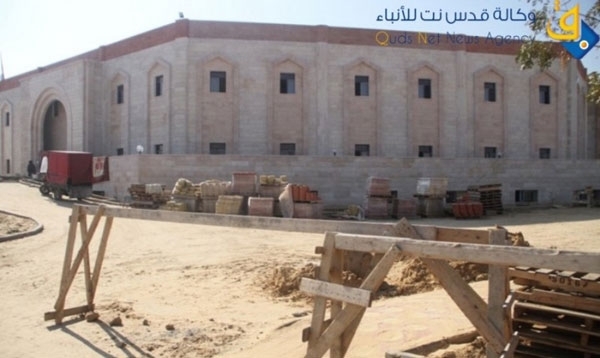 Almakhallalaty said In a press conference in the Ministry of Information headquarters in Gaza city, “80% of MOH construction projects are halted as a result of the tightened Israeli siege, the lack of building materials and other necessary related constuction materials. 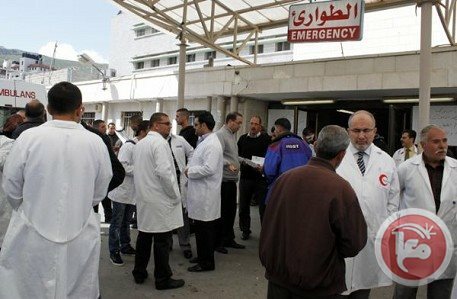 Doctors in public hospitals across the West Bank went on strike on Thursday in response to a decision by the Palestinian Supreme Court which ruled protest action by the doctors union illegal. A member of the union, Majdi al-Jallad, told Ma'an that doctors were 100 percent committed to the strike, highlighting that only emergency medical cases will be treated. There are around 1,000 doctors working in public hospitals in the West Bank, he added, warning that the union will respond with further action if the Ministry of Health punishes striking doctors. The dispute stems from a decision by the health ministry to ban doctors from working in private clinics. "In Turkey, it took them five years to ban doctors from running private clinics, and in our case, the minister made a decision on 18/11/2013 and he wants it into effect on 1/1/2014," al-Jallad said. 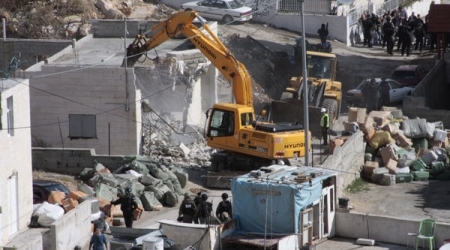 On Wednesday, the Palestinian Supreme Court of Justice ruled that strike action organized by the union in March was illegal and violated Article 67 of the Palestinian Labor Law, active since 2000. According to the law, if a certain body wishes to organize strike action which affects the public sector, the Ministry must be informed in writing four weeks prior to the strike. The law also states that at least 51 percent of laborers in the body must have signed the written notice and if the labor dispute is brought before an authority strike action must end. Gazans have learned to live with daily power outages of up to 12 hours that have affected private homes, schools, hospitals, businesses, and water and sanitation plants. The project at the children's hospital, which was partly funded by British relief charity Sawaed, was set up in January 2013 at a cost of $100,000 and is now providing 20 kilowatts of electricity per day. "My own solar set-up cost 5,000 shekels ($1,400), and with it I can get enough electricity to light my home and keep the television on for several hours, even during the regular power cuts to the main supply," Jawwad told AFP. "This is a safe way of keeping my home running ... And I only make one down-payment to set up the solar power system, rather than having to buy more petrol every day for my generator at fluctuating and often extortionate prices." 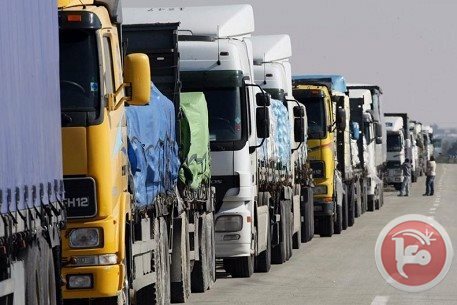 Figures released by the UN humanitarian agency OCHA show that in November, Gaza received less than 20,000 liters of fuel per week, down from nearly a million liters a day when the tunnels were operating. Gaza's sole power station ground to a halt on Nov. 1 after diesel stocks ran out. It only went back online 50 days later after a delivery of Israeli fuel which was paid for by the Western-backed Palestinian Authority. 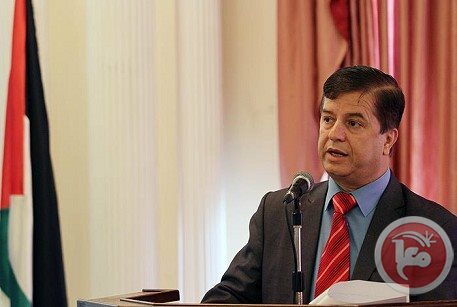 Minister of Health Mofied Almakhllaty said on Sunday that health ministry needs $ 40 million in 2014 as financial allocations to ensure the process of health services in Gaza. He said, in a visit to Alshifa hospital, that health ministry is hardly working to provide health services to the people despite the severe shortage of medical equipment and medicine due to the siege imposed on Gaza since 2007. He highlighted the importance of working to reduce the suffering of Palestinian patients by providing them the best medical service, expecting the donations to the ministry to be up to 20 million during for the current year. Doctors from a public hospital in Nablus organized a demonstration on Wednesday to protest the assault of a colleague by the relatives of a patient being treated in the pediatrics ward. Dr. Hussein al-Sleibi was assaulted in Rafidia hospital on Tuesday by two relatives of a child, doctors told Ma'an. The family members threatened al-Sleibi and two nurses with a knife during the incident after claiming they were neglecting the patient. Doctors said they organized the demonstration to protest a growing number of assaults against medical teams. Director of the Nablus office of the Ministry of Health, Amirah al-Hindi, told Ma'an that the last decade has seen a spike in violent incidents against hospital staff. "We understand the citizens' demands and we know that we should provide the best medical services possible, but they should also understand that we are humans and working with limited capacities." Deputy Representative of Japan to the Palestinian Authority Makoto Honda Monday attended the opening ceremony of the project for replacement of the laparoscopy system at Shepherd’s Field Hospital in Beit Sahour, a statement by the Japanese office. Beit Sahour mayor, Hani al-Hayek, attended the ceremony in addition to representatives from local authorities and institutions. The project was funded by the Government of Japan in March 2013, through its Grant Assistance for Grassroots Human Security Projects (GGP). 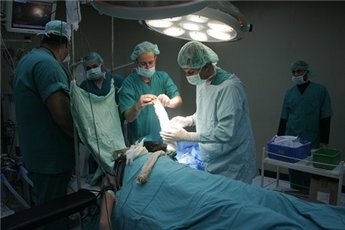 Beit Sahour Cooperative Society for Health Welfare utilized the grant of $98,700 to provide the patients in need with appropriate laparoscopic surgery without excessive burdens by conducting open surgery or transferring them to other hospitals outside their area. Honda emphasized Japan’s firm commitment of supporting Palestinian people from human security perspective as well as the importance of implementing social and economic development projects needed for Palestinian communities. Doctors in public hospitals in the occupied West Bank have started partial strike action against what they describe as "abusive practices" by the Palestinian Authority Ministry of Health. Head of the doctors' union, Shawqi Sabha, told Ma'an that outpatient services and scheduled surgeries will be suspended in all public hospitals until the ministry complies with the union's demands. 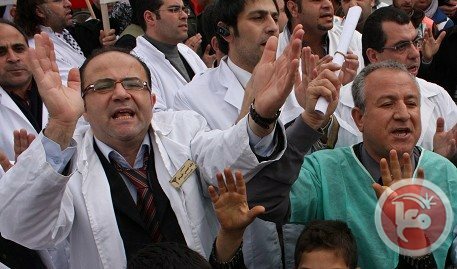 The protests were sparked by a recent ministry decision to transfer several doctors to different work locations in order to implement a 2013 decision banning doctors from running private clinics, Sabha said. He highlighted that doctors would in submit collective resignations as the ministry "continues with its abusive practices." The decision on private clinics, he added, was suspended until March 2014 for consultations between doctors and the ministry in an attempt to reach agreement on an appropriate system. The Palestinian Authority Ministry of Health is suffering from shortages in medicines and medical equipment because the Ministry of Finance has not paid the suppliers. Public hospital doctors and patients have recently been complaining about shortages in indispensable medicines and equipment such as arterial, electrocardiograph paper as well as medications for cardiac diseases, blood pressure and cancer among others. Director of the ministry's department of medical warehouses Salah Thawabta told Ma’an that public hospitals are short of medicines and medical equipment because the Ministry of Finance has not paid companies who win tenders to supply the ministry with those medicines. Thirty-five types of medicines are being supplied very slowly because the Ministry of Finance has not been paying the suppliers, he added. Thawabta said the Ministry of Health could take legal procedures against companies who won the bids. He also called upon hospital managers to buy the needed medicines using the monthly allowances their hospitals receive from the ministry, and then send receipts to the ministry for reimbursement. 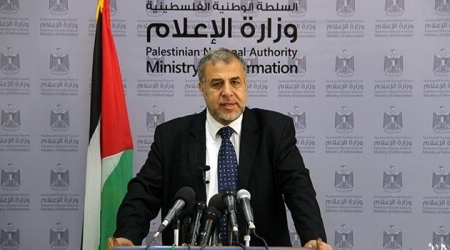 Administrative manager of the Ministry of Health Abd al-Halim Hamadnah told Ma'an that the ministry's debts reached 700 million NIS ($200 million). These debts, he said, have been accumulated in the past four years. Some 88 percent of the debts, he said, are owed to medicine suppliers and private hospitals, and the rest is owed to suppliers of fuel and cleaning materials. An Indonesian NGO has collected nearly $15 million from Indonesian citizens to build a hospital in norhern Gaza, reports Middle East Monitor. Currently there are about 30 Indonesian volonteers working to complete building the hospital. "Indonesian civil society groups in Jakarta collected donations from people who were happy to support Gaza, even though many of them suffered uneasy financial situations", said Fikri Fikri, one of the Indonesian volonteers in an interview with Quds.net. The hospital will be administrated by the local Minestry of Health and is planned to be operating in May 2014. The hospital will have 100 beds and four rooms for surgeries. 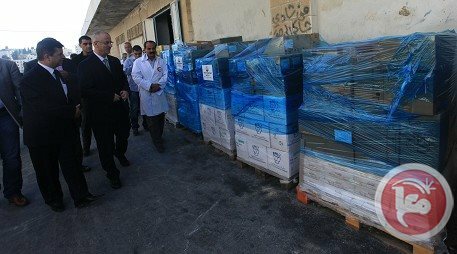 The Palestinian Authority Ministry of Health is set to send medicines and medical equipment to the Gaza Strip on Sunday, the minister of health said.